Oncology is an area of medicine that diagnoses, studies, and treats cancer. 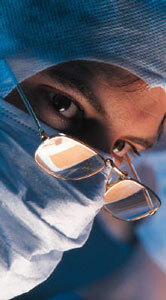 A surgical oncologist is a surgeon who specializes in biopsies and tumor removal. Many of the general surgeons at North Atlanta Surgical Associates are specially trained in oncologic surgery. We guide our patients through every step of cancer treatment, from diagnosis to recovery and reconstructive surgery. If you have any of these traits, it is important that you pay close attention to changes in your skin, and take extra precautions to avoid prolonged sun exposure. Be sure to wear sunscreen with an SPF of 15 or higher when outdoors, and reapply frequently. If possible, wear a large brimmed hat and long-sleeved shirts. Finally, be sure to see your physician at least once a year for a comprehensive skin examination. Basal cell carcinoma is the most frequently occurring type of skin cancer, and usually appears as a red patch, pearly or translucent growth, crusty sore that won't heal, or an inexplicable scar on the face, ears, back, scalp, or upper body. If detected early enough, basal cell carcinoma can usually be removed with a simple biopsy. Skin cancer removal is an outpatient surgery that generally takes no more than a few hours; however, because certain types of surgery require tissue analysis (Mohs surgery, for example), we recommend that you set aside an entire day for the surgery. There are several methods of treatment for skin cancer and pre-cancerous lesions, including laser removal, freezing with liquid nitrogen, surgical excision, and radiation and chemotherapy. Excision involves surgically removing the cancerous growth and surrounding areas of healthy skin, known as the margins. The size of the margins will vary depending on what stage the cancer has reached. With more advanced cancers, the area of healthy skin removed will be larger. There is usually some degree of swelling after excision surgery, particularly when cancer is removed from the eye and mouth areas. Any swelling will diminish within a week or so. You will wear a large bandage for one to two days, after which a smaller bandage will be placed. You will wear a large bandage for one to two days, after which a smaller bandage will be placed.